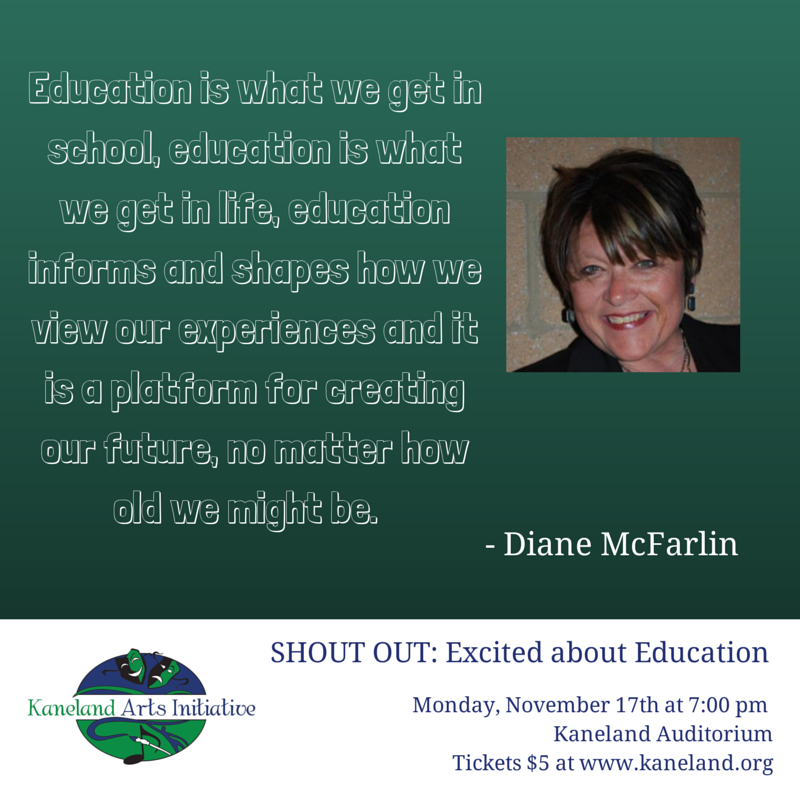 Our final spotlight is Diane McFarlin, KAI Artistic Director and Director of the 2014 SHOUT OUT! DIANE MCFARLIN is the proud Artistic Director for the Kaneland Arts Initiative directing The Music Man, Bye Bye Birdie, The Laramie Project, and Once Upon a Mattress for KAI. She is looking forward to an inspiring talk back session after directing a reading of the newest version of The Diary of Anne Frank in January. She is passionate about inspiring young people to follow their dreams as she serves her 10th year as the Assistant Principal of Kaneland High School. She is most proud of her family, creative and fierce advocates for the rights of others. Long live the arts! Diane is an amazing and passionate colleague and friend. I am always thrilled to be working with her. I hope you enjoy getting to know her better here. Do you have any favorite teachers? If so, why were they your favorite? Jim Wallace – Elgin High School – US History my junior year and Current World Events my senior year. He knew each and every one of his students, and had fun nick names for us all. He knew our stories…..challenged us, supported us, taught us with a rigor and relevance that taught me that there should always be a reason why something is taught! He made each day relevant and important! I have always carried that with me in the classroom and beyond. What is your educational background? I have a Bachelor of Science in Special Education from Illinois State University and a Masters of Science in Educational Leadership from Aurora University. I will begin taking classes at Aurora University in January to earn my Special Education Director credentials. If you are already employed, what do you do? Currently, I am the Assistant Principal for Student Services and Special Education at Kaneland High School. Do you have a favorite story that happened to YOU during your education? This is a favorite story in my family….I got lost walking 3 blocks to school. I had walked every day with “big kids” and one day all the “big kids” were sick, and I had to walk myself. To this day, I will admit…I am directionally challenged. Thank goodness for GPS! What subject in school was your LEAST favorite and why? I only remember liking school, loving school really…..I had really really good teachers! As the director of the show, I also asked her: Why is it important for us to do a SHOUT OUT? What excites you most about our cast? I am so happy to help bring Shout Out to the stage, because it is a chance for us to share our experiences, perspectives and lessons about education. Part of what makes this so special is that we have this wonderful mix of folks who are participating and helping to define what education really means. There is no one way, or right way, to talk about education because it is such a personal thing. But whether we are hearing from a Harter Middle School student, an elementary school teacher, a graduate of Kaneland or my mother, each and every one has a powerful comment or observation about the impact education has on our lives. Education is what we get in school, education is what we get in life, education informs and shapes how we view our experiences and it is a platform for creating our future, no matter how old we might be. I hope you enjoy the show and that you’ll want be part of our Shout Out next year. Tickets are still available to see SHOUT OUT! Excited about Education, tonight at 7pm in the Kaneland Auditorium. Come see these amazing cast members and hear their stories. You will be moved and inspired and … excited about education!